I’ve begun to notice that more and more homeowners are putting the finishing touch on their landscapes by having concrete landscape curbing professionally installed. 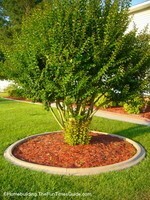 As you might imagine, I never see it installed in new homes…only homes that have mature or somewhat mature landscapes. If you choose to have landscape curbing installed, it’s a sign that you are fairly sure that you are happy with your landscaping end result and ready to end this chapter. Although…are you really ever sure that you’re truly finished? That’s a question that only you can decide. What brought this topic to mind was the fact that my parents had landscape curbing poured around many parts of their front yard recently. 1. A big reason they chose to have it installed was to make mowing the grass with a riding mower a much easier task, and it has certainly provided that feature. The smooth edges are a huge timesaver when cutting the grass with their new Toro ZTR TimeCutter Z riding mower…it’s sweet. There are a variety of curb shapes to choose from. The style shown here is a mower edge shape. 2. 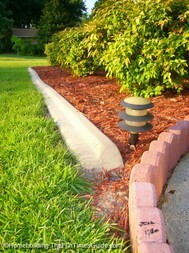 The second reason they chose to have curbing installed was to give definition to sidewalks, islands and beds throughout the front yard. You can see the magnificent results in the photos. 3. And finally, a third reason was to keep mulch in its’ place and to keep the grass at bay. You need to preplan the outline of the beds prior to the curbing contractor’s arrival by laying out a garden hose where you think you’d like to have the curbing installed. I suggest you try a few different lines to be sure you’re positive of the line(s) you desire. When you’re happy with it, leave the hose in place until the contractor arrives, then remove it once the contractor knows your plan. This is also the time to choose the style of curb and color, if so desired. The first thing the contractor will do is spray paint your desired border lines with a line marker. Next, a sod ripper removes the top layer of grass and soil in preparation for the concrete curb. The contractor will then spend some time mixing concrete to be poured into the curb extruder machine. The contractor, with a helper, will then slowly move the patented concrete curb extruding machine (similar to the one shown in the link…there are many) along the designated border as it extrudes and forms a continuous curb…all in one step. Before it dries, a couple of things need to be taken care of. If a colored curb is desired, the contractor will pour a colored slurry over the curb and then hand trowel it into the surface. Depending on the company you’re dealing with, a second color application may then be applied and stamped onto the surface to give it a richer look. This is also the time that a pattern could be stamped into the curb, if so desired. The final thing to do is to create expansion joints to prevent cracking. After the concrete has had time to dry, the contractor will then apply a sealer to the curbing. That’s all there is to it and the entire job can be completed in a single day! I’ve spent a good deal of time looking at a number of companies to see how this is done and KwikKerb seems to have the edge on everyone. Edgetec Intl. manufactures the patented Edgemaster curbing machine and it is sold exclusively through KwikKerb, so if you’re interested in being your own boss then you need to check them out. As I mentioned earlier, there are many manufacturers of curbing machines so choose wisely.